When I was back in Connecticut I had a chance to visit the place I grew up, The Advent Camp Ground. We lived in one of the cottages on the grounds. 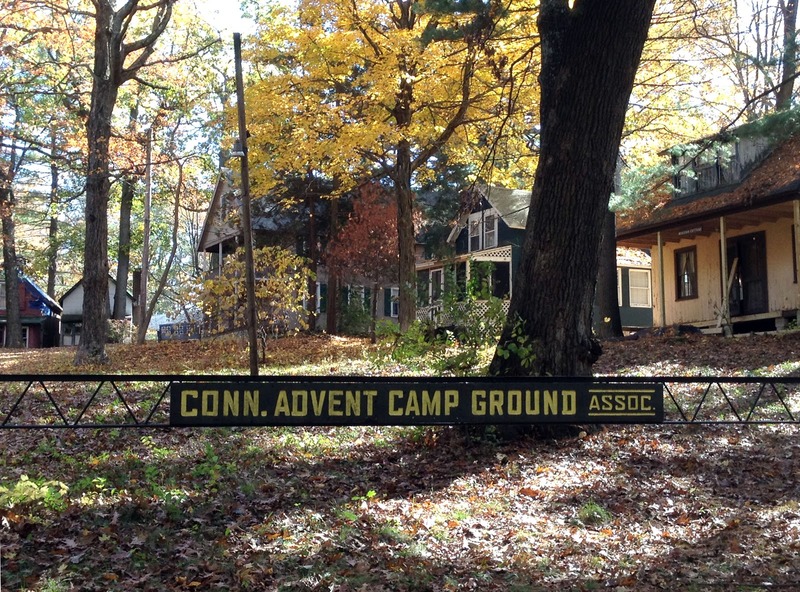 If you're wondering my connection to the Camp Ground, both my families were involved in the Advent Christian Church. On my mother's side, both Grandparents attended one of the churches. 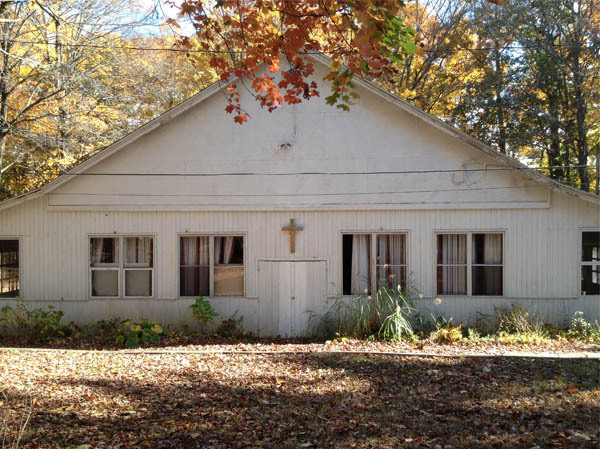 On my father's side, my Grandfather was a pastor for one of the Advent Churches. This might have you asking if I'm an Advent Christian. The simple answer, I'm a practicing christian but I don't practice the Advent Christian doctrine. I took a lot of pictures on my trip so I'm going to try to be selective and only show a few but I'm not promising anything. I feel like there's so much I want to share and say. See that brown house on the left? That's where I grew up. I have fond memories riding my pink powder-puff big wheel down this street. I also recall how tiring it was to drag it back up the hill. 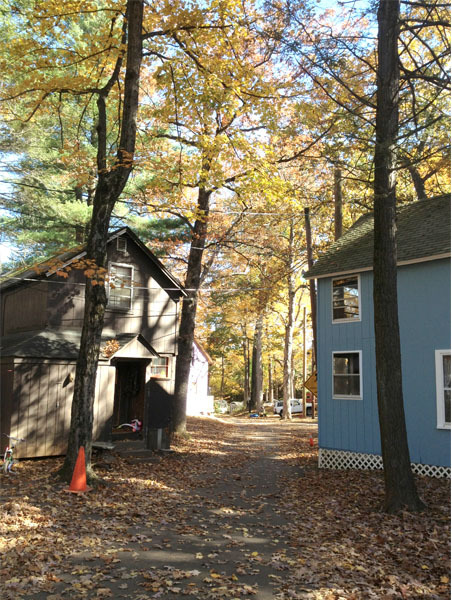 There was so much to do on the campground, jumping in freshly piled leaves in the fall, sledding in the winter, and swimming in the summer. On the campground there are about 40 cottages that all look similar to the ones pictured above. 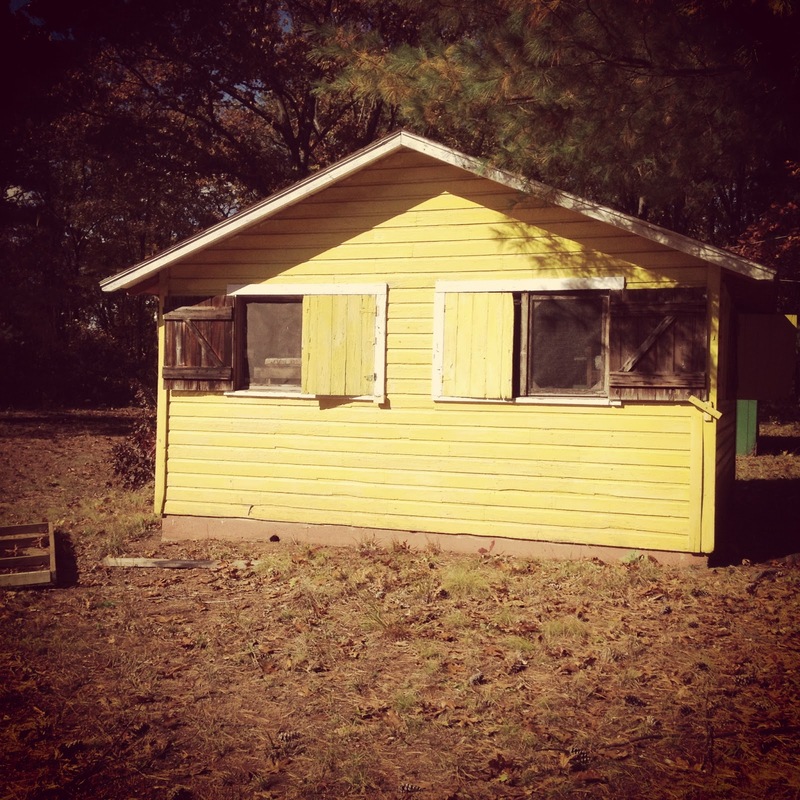 Most often they would be vacant in the fall/winter so the porches became my stage for playing. One of the things I liked most about the campgrounds was the camp. Every summer my home would be flooded with campers and I loved it. I got to make use of their snack bar where I was formally introduced to fireballs and pizza flavored combos. I also would spy on their church services at the tabernacle (more about that later). When I lived here I was too young to attend the camp. It wasn't until I moved from the grounds, that I got to attend Camp Faithful. This is one of the boy's cabins. They're your typical run-of-the-mill cabins, bunk beds and a light. If you had to go to the bathroom, plan on bringing a flashlight for the trek. 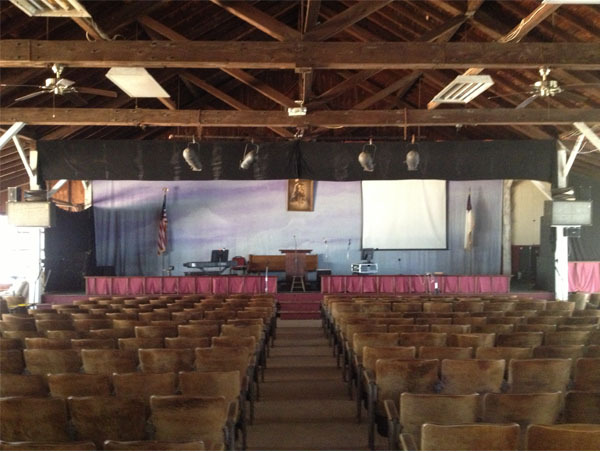 This is the tabernacle where the services would be held while camp was going on. On both sides of the church the walls open up like garage doors. Often I would stand outside and watch what was going on. Sometimes I would even sneak into one of the seats. And it just so happens that the doors were open when we visited so I got to take a peek inside and snap a couple photos. Here's a better picture that shows how the windows/doors open on the side. See all those windows behind me? They open too. And if you look at the top of the picture, you can get an idea of what I mean by garage doors. So I have to ask, has anyone been here before? 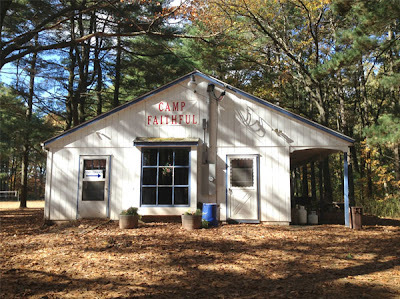 Have you ever gone to camp here? I would love to here your story and your connection to this place. wow, what a fascinating place to live as a child! The camp and surrounding woods are so beautiful, the little Victorian cottages really amazing. I for one would love to hear more about this part of your childhood! What an amazing place to grow up. 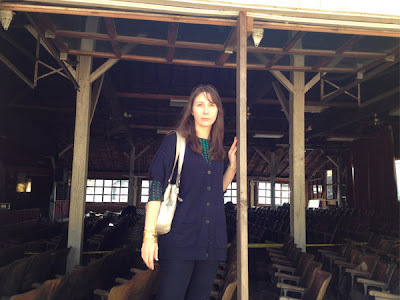 This past summer I visited the campgrounds on Martha's Vineyard (Oakbluffs). It was so memorable. 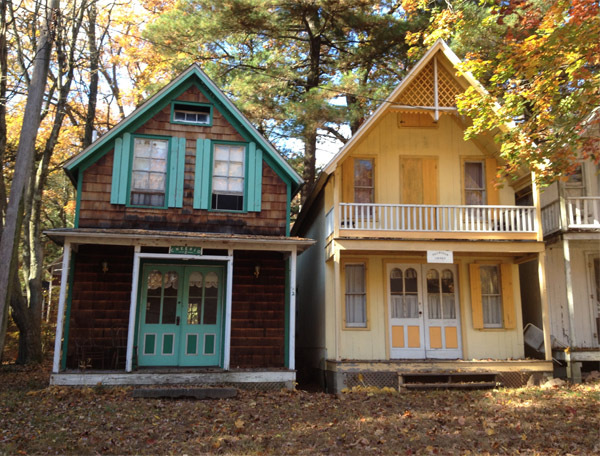 Similar to your photos, gingerbread cottages wage a fascinating religious history. My childhood was pretty normal. I even was able to attend a public school. What I forgot to mention is that the Campground has a shopping center down the block from it and a neighborhood beside it. When you're on the camp ground, it looks like you're in the middle of no where but you're actually close to civilization. I remember your Martha's Vineyard post because it reminded me of the camp ground. I think I might have even left a comment on you post about it. I agree, the religious history is interesting. My understanding is that the Advent camp grounds were built for the second coming of Jesus. They believed they would all live there when He returned. Pretty neat place, your old stomping grounds. I'm with Michelle L., I'd be very interested to hear more!